Map It! 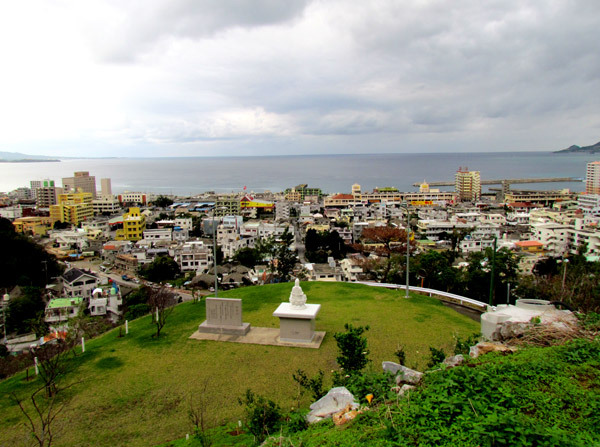 Okinawa: "Kannon-sama, The Goddess of Mercy – Nago City"
The statue you see above is a Bodhisattva referred to in Japanese as Kannon or Kannon-sama, also known as the 'Goddess of Mercy'. She is referred to by many different names in different languages and has taken both male and female forms depending on the folklore and legend. 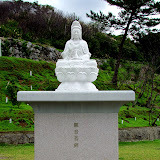 There are many such statues of this Bodhisattva that exist of much, much greater size and magnitude in other East Asian countries, to include Mainland Japan. 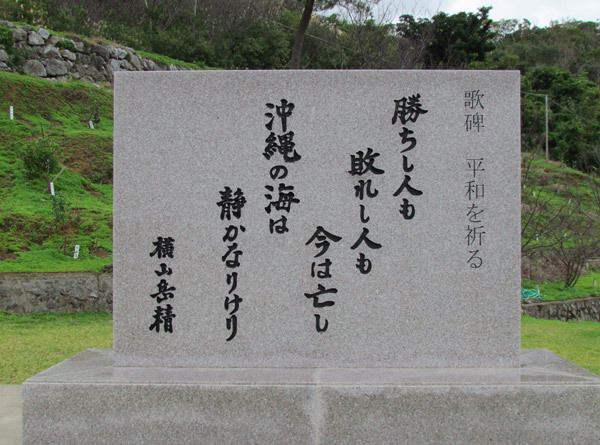 This one, in Nago City, is a modest size of about 15-16 feet in height. Nevertheless, the scenery itself is a trifecta of sorts. First, the Bodhisattva is surrounded by Nago's greenery of trees and mountains. And then there is the Cherry Blossoms behind the statue strategically laid out on a hill top making this an ideal spot for your photographic moment during blooming season. 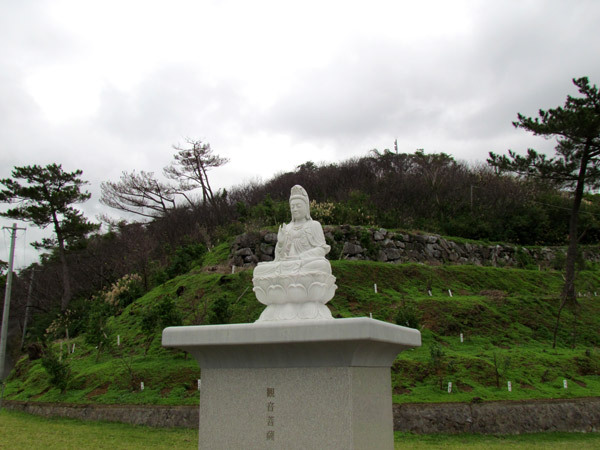 And finally, the statue overlooks a very calm and beautiful view of the Nago Bay. The interpretation of the poem, of course, is left open for discussion. But being that this is the 'Goddess of Mercy', the message is certain to be one of peace. Getting there. The location is south of the Orion Beer Factory on a hilltop. There are several ways to get there. You can either take Highway 58 and approach it from the west or approach it from the east on Highway 18. Please see map above for recommended entry (blue route). Depending on which highway you use, the turn-off will either be the very last turn-off to the right before you go up the Nago Green Bridge or the very first turn-off to the left as you are coming down the Nago Green Bridge. Parking. If this is your first time attending this location, I recommend parking at the base of the hill and walking up, especially during Cherry Blossom season. At some point the road is only wide enough for one vehicle and 3-point turns are difficult. It is not too difficult of a walk from the bottom. Possible parking spots have been plotted above. 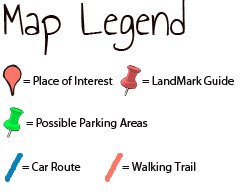 The Pink Thumbtack icon marks another entrance way to the statue location from Highway 18, but it is easy to miss. It can also be used to exit onto Highway 18 as you leave the statue area. Caution. If you notice on the map there is another route branching off that goes further south roughly paralleling Highway 18. Be advise that tremendous road damage existed on this route when last visited in early December 2011. Warning signs have been place. Do not go past these signs. The roads were severely damaged due to an eroding hillside. 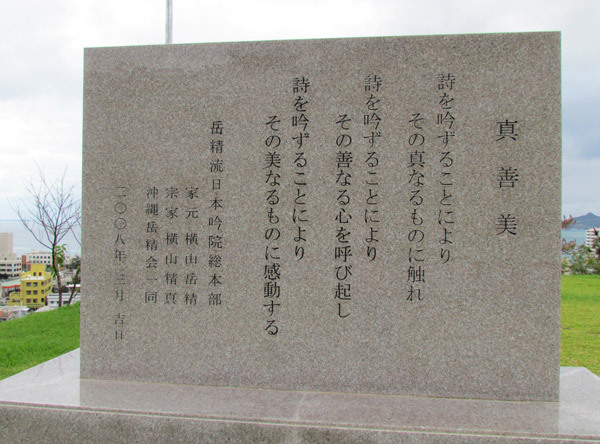 Other places of interest nearby: Ato no Utaki (Kyoda), Big Okinawan House, Scenic View Mount Tanodake,Giant Shisas (Kyoda), Green Bridge/Lower Creek Park, Haneji Dam Family Picnic Area, Mikaya Dam, Nago Museum,Nangusuku Castle Ruins, Route 18/Haneji Dam Route, Todoroki Waterfall (Sukata), Water From Hands (Kyoda). Source1*: White-robed Guanyin: The Sinicization of Buddhism in China Seenin the Chinese Transformation of Avalokiteshvara in Gender,Iconography, and Role by Jeong-Eun Kim. Source2: Japan Times - The Goddess of Mercy and Pets. 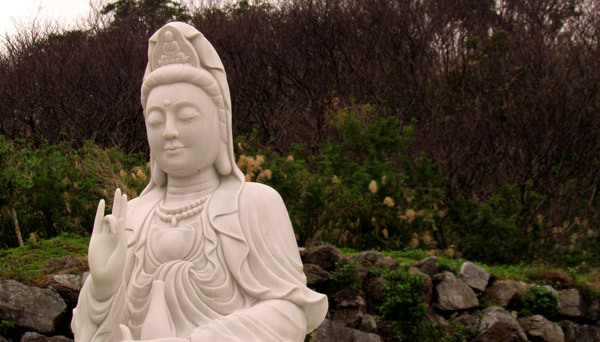 *Note: Guanyin is the Chinese name for Kannon-sama.